Challenging ISIS has little to do with their number of followers, or the decline in their number of messages. This type of tactical-level data can indicate success, but genuine impact can only occur with robust interpretation of data at the strategic level. Recent studies have been used to claim success in reducing the number of followers and volume of ISIS content on social media. Reports which appear to show decline are seized on and used by many of the Public Diplomacy and Information Operations strategies deployed against ISIS, which seek opportunities to highlight failures and losses of the group. Yet it is equally clear that, despite increasing efforts by western governments and social media providers to counter ISIS online, ISIS continues to produce and disseminate large quantities of ideologically-inspired audio visual content and information. Equally, individuals who have never had direct contact with the group commit acts of violence in their name. As such, it is often the case that the detail tells a different story than some of the claims made about the data, specifically that ISIS is experiencing a decline in followers and content on Twitter. Claims of success against an adversary must account for fluctuations in said adversary’s tactics. Social media platforms are fundamentally social networks. 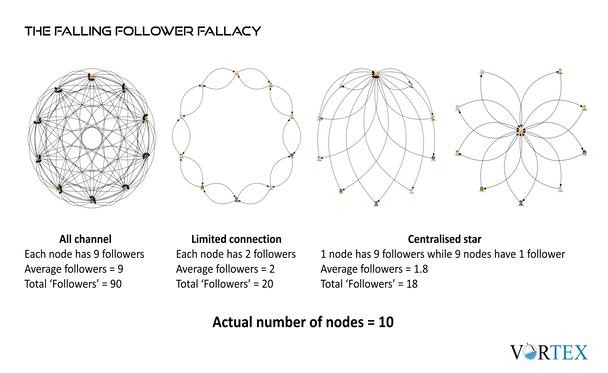 The metrics about followers which Twitter produces are accurate for an individual account, but cannot simply be aggregated to show the total number of followers in a specific network. If number of followers is aggregated, it will likely produce wildly inflated numbers for reach, and equally overstate the decline in ISIS social media. The falling follower fallacy is demonstrated in the image below. In it, the same nodes are shown connected in different configurations, similar to the three types or topologies John Arquilla and David Ronfeldt highlighted in their discussion of Netwar. Aggregating follower numbers inflates the number of accounts that appear to be in the network. The decline in aggregated follower numbers cannot be read as showing decline in the number of accounts in the network. The decline in aggregated follower numbers cannot be used to show that the network is being disrupted. Ultimately, the Twitter strategy is to disseminate content, not gather followers. In fact, distributing content rather than gaining followers is the stated objective within ISIS networks, and as shown here, this is entirely possible despite declining aggregate follower numbers. Michael Lumpkin, head of the Global Engagement Center, has stated that “We're denying ISIL the ability to operate uncontested online, and we're seeing their social media presence decline.” Correspondingly, according to figures made available by the U.S. government, Twitter traffic for ISIS has gone down by 45% over the last two years. It is the second element which is key. Changes in strategy are often circulated in Arabic and the nuance it contains is sometimes overlooked by English-speaking researchers. This nuance includes shifts in the platforms, terms or hashtags around which initiated supporters coordinate. For example, the recent RAND study, Examining ISIS Support and Opposition Networks on Twitter, lists a range of Arabic terms for the Islamic State and Daesh. However, during the time period for the study, ISIS supporters (particularly deeply-initiated and core supporters) increasingly used tags relating to a specific wiliyah (province) which are not included in the search terms. Some tweets will have used both terms for the state and the province, but many do not. This can skew the result and produce an impression of decline when in reality supporters have simply shifted the way they communicate. Equally, shifts in emphasis within ISIS strategy over the last 18 months can lead to the success of disruption being overstated. In addition to the shift in terms used, for over a year ISIS has reframed the purpose of communication via Twitter. Around a year ago, a significant proportion of ISIS Twitter traffic stemmed from core members of the Swarmcast maintaining communication and ensuring the mujahidin vanguard could access ISIS content. But more recently, core supporters realized that much of the effort sharing content amongst the vanguard was unnecessary. A video statement instructed the vanguard to focus on extending the reach of ISIS content instead, and at a similar time, ISIS supporters and media “foundations” increasingly adopted Telegram. These shifts in focus reduced traffic on Twitter, as communication amongst the vanguard moved to Telegram. This shift was codified in a statement released in June 2016 by Al-Wafa (a charity listed among sponsors of terrorism in the U.S. intelligence community), which identified Telegram as a “safe haven” for communication with the mujahidin vanguard to coordinate, but that the battleground continued to be on platforms such as Twitter and Facebook. This was reiterated at the end of September with another Al-Wafa’ statement which named Twitter to be the front in the media war, and encouraged supporters to commit to extending their reach on Twitter rather than become isolated in the safe haven of Telegram. These shifts in strategy and online behaviour of the media mujahidin are part of the changing landscape across which the media war is fought. As demonstrated, claims of success against an adversary must account for fluctuations in said adversary’s tactics. Conclusions must be based on shifts in metrics in combination with shifts in strategy, and be wary of the numerous information operations active in the media ecosystem around ISIS.